This is a post about my mantel that isn’t a mantel at all. It is my pretend-mantel, my I wish-you-were-a-mantel-mantel, it is the shelf that I decorate as a mantel. I was going through some images of the past few years. And this particular corner in my living room kept coming up again and again. And even more and more as time went by. I thought it was so funny to see all those transformations, the way those reflected my mood and the way they represented my style and how that has changed and how it has stayed the same. I thought you might enjoy this journey along memory lane and my mantel style evolution too. 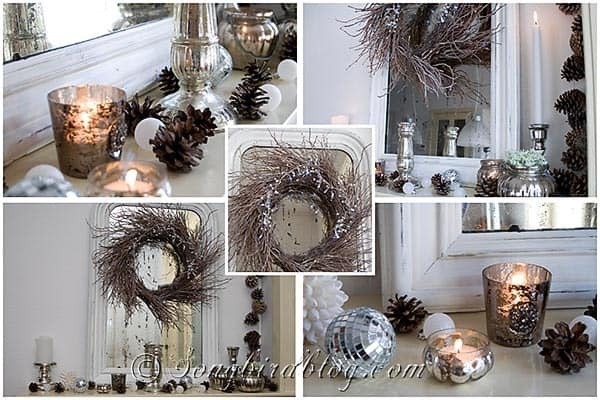 (More than) 25 Ways to Decorate your Mantel….. Here is the first time my “mantel” appeared on my blog. If I remember correctly those roses were for celebrating painting all the walls in our living room freshly white. You can’t tell from this picture though, they look pink. Photography skills weren’t up to par either. That pink roses mantel was from May, this is October that same year. No idea how my mantel looked in the mean time, but apparently it wasn’t photography nor blog worthy. Those apothecary jars were very much blogging influenced. I saw them so much on blogs in those days that I searched high and low for my own jars. I haven’t used them in ages anymore. Funny that. Ok I am betting the next one is Christmas…..
Hmm, I found one small picture of a mini mantel decoration that Christmas season. Can’t imagine that now. The mantel doesn’t appear again until….. This is my first summer mantel. Funny I didn’t even take a complete frontal view picture then, I could only find these detail shots. Looks like I am still working the glass jars and I seem to remember being very happy this time round that I had found a cloche too. Again heavily influenced by many blogs. And look: that little lamp had a shade change for summer too. 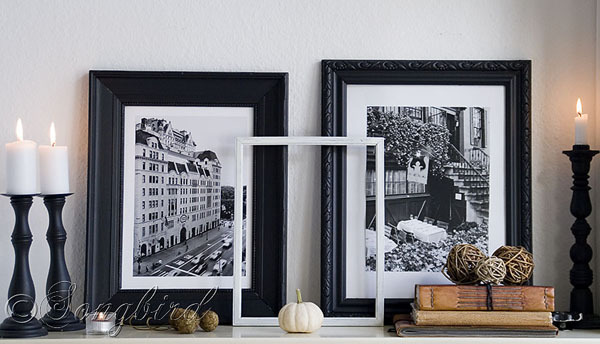 Ok, where will we end up next…..
Back into Fall and there is only 1 image of my mantel to be found! Still working those jars. But at least I have started to try and cover up that radiator knob…..
Ha, here is my first official Christmas mantel posted on the blog. Working the glass, baby, working that glass. I still like this though. And I remember that it was very sparkly and festive and that the whole time this was up there wasn’t an evening without the candles being lit. I think this one might have started the whole mantel decorating thing. Because that shelf (which is obvious a radiator cover) starts to become a frequent guest here. See this one was right after Christmas in January. When I craved white and simplicity. Photography skills are clearly improving too. I did a full “how I decorate and style my mantel post” back then. Funny come to think of it, since my mantel decorating skills where still very much developing. But I think I am beginning to distinguish a certain Songbird style here already. The candles, the flowers, a theme, an underlying concept if you will. It is definitely not so haphazard anymore and less overtly influenced by other bloggers (or so I’d like to think anyway). This is March and the first (of many) glamour appearances of my twig wreath on the blog. And see that clever disguise of the knob! Hé, and I crafted for this one too. Not only the twig wreath is homemade so is that plaster doily bowl. In May I did this hot pink mantel for a mantel party. Quite festive, don’t you think. This is a colorful phase, because the next one also has a colorful flower / white decorations contrast going on. Summer brings us right back to Fall again. And the twig wreath again. This was quite bare. I think this was when my sister from New Zealand was visiting and I had other things on my mind than decorating. Made up for that later in the year though. When Christmas came rolling around. That was the year of natural, simple yet sparkly Christmas. My mantel set the tone for the decorations that year. And although they were simple, it was still a full house of Christmas decorations. So no wonder come January I was craving, white and silence and empty space again…. But I was on a roll, mantel wise. There were three mantel variations that month. All featuring my feather wreath. The next one is definitely not my best mantel ever….. But I do still dig the layered mirrors. And aren’t those cupcake candle sticks cute. This was their first showing. They got glammed up later unit proper plaster cupcake candle holders. Long gone now. Ah memories. This next mantel I actually forgot all about…. My pallet wood mantel which underwent many changes and reappeared several times. It worked its magic until Fall. And yes this time there is no twig wreath in sight on my Fall mantel. This was the mantel where I tried to make it a bit more masculine, a bit more my Love’s style. A bit less flowery and feminine. I think I did quite good. Which in turn let to a white January mantel (are you picking up a theme here….. )…. Which turned into my Spring mantel by adding feathers and flowers…..
And then the circle is round and we end up with my Summer Beach Mantel of 2012. So what do you think? Do you recognize it all as Songbird? Are all those mantels ME? Or is there one that you think is more or less a true representation of my style? Let me know in the comments or let’s talk about it somewhere on the internet. PPS I am working behind the scenes on a proper Project Gallery. I hope to have it finished rather sooner than later. Most of these mantels and more will show up there again. But in the mean time if you want to see more pictures of a particular mantel you can go to my (not recently updated) Decoration page and if you’re lucky you will find a link there. PPPS My summer holiday has officially started. YEAH!! funny. Your most printable is one I’d say I don’t recognize as being you…so much. Then I think the very first one with the pink candles and flowers… I don’t think I knew you then. So…it doesn’t ring any bells for me. My favorite? The “intermezzo white flower mantel”… love the layered mirrors and the rustic lanterns. That one is perfect! I have a mantel. It is a surround for my heater…there is no fire place there. I’ve never shown it. It is in my ‘Future-Home- of – THE DEN- Room’ … My pc is in that room and well, it isn’t pretty yet! LOL… I’d love to have a mantel in my living-room especially behind the wood burning stove. I actually have plans for a piece I got off the curb last week. I think it will make a perfect ‘mantel’ …the one in the future den…is just to small for there. Hmm, sounds like you have some good mantel prospects in your future. I am sure it will be great and so fun to decorate. That Fall mantel from last year definitely was a bit further away from my natural go-to styling. And yet I loved it too. It fit my Fall living room very well and I loved the toned down colors. Go figure, I can’t figure out my own style…. Love this review of your mantels. My favorites are the white with soft pops of color and the summer seashell mantel and the twig wreath…..I guess I have many favorites! I love your style. I don’t think I myself can pick a favorite either. I have a thing for all of them. Thanks for the mantel love. The intermezzo is my favourite… this post will definately be my go to post when I feel like rearranging my mantel that isn’t a mantel!!! ..Yes I too have no mantel but I do have a high dresser near my front door that currently my partner has decided looks great with a pile of newspapers thrown on top…ggrrrr! Mental note… buy cool basket for behind front door for his papers! Hihi. It also helps to decorate that dresser with lots of stuff so there is no room for the papers (I speak from experience), it will mean that paper, bags, keys, etc will end up on the floor (again experience) because it will not make them magically get put away. So those baskets sound like an excellent idea. I love the simplicity of the white tulips in the jars with the mirror and wreath. it was fun to look back at all of your designs as I’ve been only reading your blog for the past few months and quite enjoy it!! This made me think of a store we have here in the US called Pottery Barn and they have a mantel they just call it the “decorative ledge” but it is very weathered looking and many have used it a their “faux” mantel, so to speak. it would fit in really well with your style. maybe you could build up a a “faux” mantel with some wood and moulding or whatever. But…anyway I really enjoy reading about what you do and love your taste and style. thanks for sharing with us! I don’t think I could handle two ‘faux’ mantels in my home. And since I don’t see a real one anywhere in my future, I better keep using my radiator shelf. And I have visited Pottery Barn once. I like their goods and especially the way the create their displays. Your mantels are all great. I love the one with the twigs, and the one with the mercury candlesticks best. I think that all the mantels can reflect your style because, if you’re like most of us, style is fluid, not static. In different moods you probably create different mantels. You are so right. My mood definitely has in impact on when, why and how I decorate. But I guess that is how it should be…..
Beautiful mantels! My only mantle in our new home houses a dvd box with a big flat screen over it. Maybe I could use some of your ideas to “hide” the box and dress it up! Thanks!